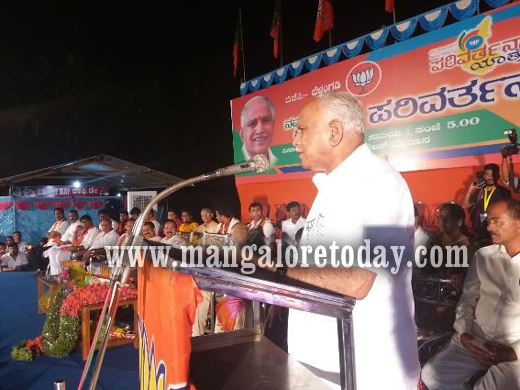 Belthangady, Nov 11, 2017: State BJP Chief B S Yeddyurappa has said that the party would choose candidates for the next elections based on the internal survey. Addressing a rally at the Prasanna College premises at Laila on November 10, Friday night as part of his Nava Karnataka Parivartana yatra, Yeddyurappa said there was no need for aspirants who fail to get tickets to be disappointed as the party would try to accommodate them in various positions if it forms the next government. Yeddyurappa also lashed out at the state government stating it has failed to come to the help of farmers. Union Minister D V Sadananda Gowda who also spoke assured a transparent government if the BJP comes to power. MP Nalin Kumar Kateel, State BJP Chief Secretary Ravi Kumar, District BJP President Sanjeev Matandoor, MLC Capt Ganesh Karnik, Taluk BJP Chief Ranjan G Gowda, Kumar Bangarappa and others were present.